There's something about a simple bordered quilt that I love. 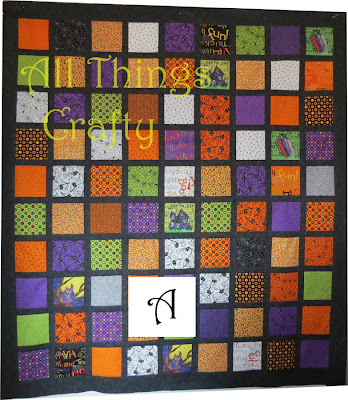 However, I had plans to add a pieced border to the simple Halloween quilt I am working on. I got the first solid border on the quilt and re-pinned the quilt to hang it. 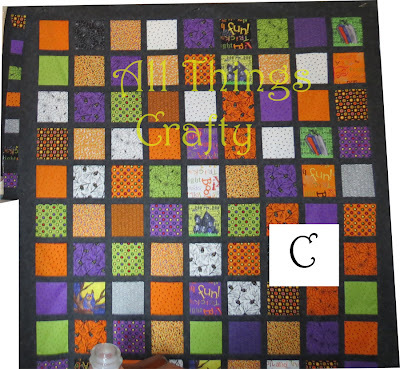 I then placed the pieced border beside one side and the final solid border to preview what's to come. Now that I did, I'm not so sure about the pieced border. It seemed good and it's the whole reason I purchased another charm pack. But, now that it's up, I'm not so sure. I tried the full 2.5" pieced border with the outer solid border and then I thought maybe I'll cut the pieced border in half to make really thin rectangle pieces all around. Hmmm... I wish all decisions were this fun. So, now as I do housework <bad word>, I'm debating leaving it with a single plain border (Option A), the mini pieced border (Option B) or the full pieced outer borders (Option C). You can only see the border option in the top left part of photos b and c. I just hung the border beside the quilt to photograph. I'm thinking if I post this and keep coming back looking at the photos, the decision will hit me. Or, when hubby comes home from work, I'll hit him with the question the minute he walks in the door! I really like B. It takes the eye from border to quilt with just enough color! A is too plain for me and C detracts from the center in my opinion. But this is your quilt and only your opinion matters. I like B too the best...and C but not as much as B! Both of these give the quilt the WOW factor! !